After an ample share of ups and downs throughout the past spring, the weather in June became rather typical for the start of summer. It was drier than average in the north and wetter than usual in the south, with the temperature close to the long-term mean. Fortunately, New Jersey entered the heart of summer with reservoirs full. However, with the onset of an apparent extended period of heat late in the month, it is certainly prudent to conserve water wisely. The June average statewide temperature of 69.8° equaled the 1981–2010 mean, but is 1.0° above the 1895–present average. This tied with 1906 and 1967 as the 42nd mildest June on record. Precipitation averaged 3.43” across NJ, which is 0.58” below the 1981–2010 mean. This ranks as the 57th driest June, tied with 2011. There were ten June days where the temperature equaled or exceeded 90° at one or more of the over 60 NJWxNet stations. Only two occurred during the first half of the month, with Moorestown (Burlington County) up to 90° on the 2nd and Mansfield (Burlington) at 90° on the 14th. The heat then turned on in earnest, with 24 stations between 90°–92° on the 17th. Haworth (Bergen) and Pennsauken (Camden) reached 94° and 36 stations 90°–93° on the 18th. This was followed by six stations at 90° on the 19th and Pennsauken to 90° on the 20th. The 24th saw Pennsauken, Moorestown, Vineland (Cumberland), and Upper Deerfield (Cumberland) top out at 90°. A major heatwave began to unfold on the 28th, with Mansfield at 94° and 14 stations 90°–91°. Mansfield again reached 94° on the 29th, with four stations at 93° and 37 between 90°–92°. The 30th was the hottest day of June, with 97° attained at Vineland, Pennsauken, Columbus (Burlington), Oswego Lake (Burlington), and Piney Hollow (Gloucester). Visit the NJWxNet website to see how the heat continued into July and read the July report for a full recap. Given the near-average June temperature, it is not surprising that along with 90° days, ten dates saw minimum temperatures bottom out in the 40°s at one or more NJWxNet locations (note that temperatures at regularly cold Walpack (Sussex) were not observed in June due to a malfunctioning sensor). High Point Monument (HPM (Sussex); 1755’ elevation) fell to 47° and High Point (Sussex; 1388’) 48° on the 3rd. These stations followed with 45° and 46°, respectively, on the 4th, with Charlotteburg (Passaic) and Parsippany (Morris) each 48°. Berkeley Township (Ocean) and Pequest (Warren) were each a chilly 44° on the 5th, with 12 other NJWxNet stations between 46°–49°. HPM was 46°, High Point 47°, and Pequest 48° on the 6th, followed by Basking Ridge (Somerset) and Pequest each at 49° on the 8th. Basking Ridge bottomed out at 46° and four stations at 47° on the 11th. The 12th was the coolest June morning, with Berkeley Township a brisk 40°, Pequest and Basking Ridge 41°, Kingwood (Hunterdon) and Howell (Monmouth) 43°, and 38 stations between 44°–49°. Pequest was 45° and Basking Ridge 47° on the 16th. Preceding the end-of-month heatwave, Pequest fell to 45°, Basking Ridge 47°, and Kingwood and Charlotteburg each 49° on the 26th. Berkeley was 49° on the 27th. The southern half of New Jersey received close-to-average precipitation in June, while much of the north came in somewhat below average. Exceptions on the wet side included portions of Burlington, Ocean, and Cumberland counties, where Riverton (Burlington) saw 8.00” fall, about twice the monthly norm. This was followed by Fairfield Township (Cumberland) at 7.98”, Cinnaminson (Burlington) 6.94”, Berkeley Township 6.33”, and Mount Laurel (Burlington) 6.31”. Areas receiving about half of average June precipitation included Egg Harbor Township (Atlantic) with 1.72”, Springfield (Union) 1.90”, Cranford (Union) 2.12”, Blairstown (Warren) 2.15”, and New Providence (Union) 2.20”. As mentioned above, these totals were enough to keep reservoirs close to full, though any continuation of subpar rainfall and excessive heat could quickly put a strain on the state’s water resources. There were nine events during June that resulted in an inch or more rain falling at one or more locations around NJ. The first barely made the mark, with Bernardsville (Somerset) picking up 1.00” from a thunderstorm during the evening of the 1st. Woodbridge (Middlesex) saw 0.93” and Long Hill Township (Morris) 0.85”, with only scattered locations in the northwest and east central picking up precipitation. Next up were scattered showers from the afternoon of the 2nd into the early morning of the 3rd. Rain fell in the north and south, missing most central locations, and included totals of 1.80” in Salem (Salem), Cinnaminson 1.44”, and Washington Township (Gloucester) 1.44”. Rain resumed again in the south during the afternoon of the 3rd, working its way to the north during the evening and falling moderately in many locations prior to dawn on the 4th. Almost the entire state received more than 0.40”, based on over 200 CoCoRaHS reports. Most locations south of the Atlantic City Expressway picked up over an inch, which was also the case northward through the Pine Barrens. Woodstown (Salem) topped out at 1.99”, followed by Fairfield Township with 1.91”, Bridgeton (Cumberland) 1.64”, and Mt. Ephraim (Camden) 1.51”. Winds gusted to over 40 mph on the 3rd, with Fortescue (Cumberland) reaching 44 mph and Harvey Cedars (Ocean) 40 mph. Dry conditions prevailed until the 9th, when a localized deluge occurred in Cumberland County. 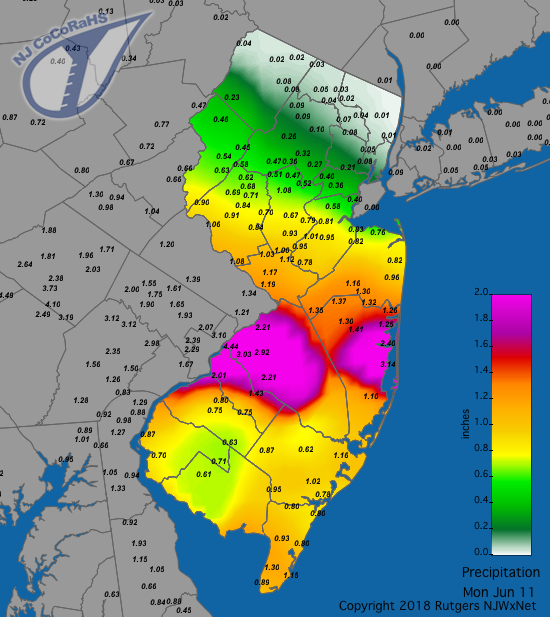 Flash flooding resulted from 4.52” in Fairfield Township, with Bridgeton picking up 1.78”, Estell Manor (Atlantic) 1.52”, and Woodbine (Cape May) 1.11”. No rain fell elsewhere in the state until off and on rain developed during daytime hours of the 10th, lasting until predawn on the 11th. The precipitation map (Figure 1) shows a heavy swath from western Camden and Burlington counties eastward to the Ocean County coast. Within this zone, Mt. Holly (Burlington) was clobbered with 4.98”, Riverton 4.44”, Berkeley Township 3.50”, Pine Beach (Ocean) 3.40”, Cinnaminson 3.30”, Mt. Laurel 3.21”, Lacey Township (Ocean) 3.14”, and two Moorestown locations each with 3.03”. Seven other stations observed 2.00”–2.99”, while 44 sites had 1.00”–1.99” out of 196 CoCoRaHS reports. Only the far north received less than several tenths of an inch. Figure 1. Rainfall totals from the morning of June 10th to the morning of the 11th. Observations are comprised of reports from CoCoRaHS stations. Scattered showers developed on the 13th, followed by a squall line diving from north to central areas very late that day into the early hours of the 14th. High Point Monument saw a gust to 45 mph and trees were reported down in Warren County. Due to the quick movement of the storms, rainfall did not make the inch mark, with Washington Township (Warren) leading the way with 0.64”, Clinton (Hunterdon) 0.59”, and Lebanon (Hunterdon) 0.56”. No more than 0.25” fell outside the area of southern Warren and northern Hunterdon counties. The 18th saw an evening squall line move southeastward through northern and central counties. Trees were reported down in Hunterdon and Morris. As is typical with summer storms, precipitation totals varied quite a bit locally. For instance, in this event, seven stations in Franklin Township, a 45 square mile community in Somerset County, reported 1.43”, 0.98”, 0.81”, 0.80”, 0.67”, 0.58” and 0.20”. Elsewhere, Bridgewater Township (Somerset) saw 1.40”, with 1.08” and 1.16” at two Manville (Somerset) stations. Over 0.50” fell in the Interstate 78 corridor, tapering to less than 0.25” north of Interstate 80. Little fell to no rain fell below northern Monmouth and Mercer counties, except for a 0.50” pocket in western Burlington County. Heavy showers fell in the early morning hours of the 21st in Burlington and Ocean counties and in the northeast corner of the state. A smattering of totals of several tenths of an inch occurred in the south and the remainder of the north, with little to none in central sections. Three Stafford Township (Ocean) locations caught 1.33”, 1.14”, and 1.09”, Woodland Township (Burlington) 1.10”, Berkeley Township 1.03”, and Palisades Park (Bergen) 0.96”. The 24th brought afternoon and evening showers to northern and central counties. The Interstate 78 corridor again saw the most, along with the northern Highlands. Little or no rain fell elsewhere. Franklin Township (Somerset) received 1.01”, Lebanon Township 1.00” and 0.97”, and Clinton 0.97”. The final event of the month began with scattered evening showers on the 27th. This transitioned to storms in the predawn and morning hours of the 28th, later ending with scattered afternoon and evening showers. Welcome totals exceeded an inch in a partial ring that swung from Mercer and Hunterdon counties northward into Warren and Sussex and east into Passaic and Bergen. Lambertville (Hunterdon) saw 2.28”, two Hopewell Township (Mercer) stations 1.82” and 1.27”, Palisades Park 1.63”, River Edge (Bergen) 1.56”, Montague (Sussex) 1.51”, and Mansfield (Warren) 1.46”. Several tenths or more fell elsewhere in the northern half of NJ, with no more than a few tenths in the southern half. A wind gust of 43 mph was observed in Stewartsville (Warren). Other than the three days mentioned earlier, there were no other gusts exceeding 40 mph at NJWxNet stations during June. The highest barometric pressure observed was 30.25”–30.30” on the 12th, with the lowest 29.60”–29.65” on the 5th.